As you know, the vast Parsnips fortune was amassed by doing those little surveys on the back of sales slips. Oh yes: a free entree at Panda Express with purchase of any 2-entree plate here, a free Whopper Junior when I buy a medium fries and drink at Burger King there – it all adds up! Recently I was scouted, via register receipt, by the Wendy’s Corporation about joining their operation as a consultant. Ask anyone in the business world today – they’ll tell you consulting jobs are where it’s at. You’re not an actual employee with the company, so you don’t have to sit through the sexual harassment video tapes. But the billable hours, man! Thankfully, this being the 20th century, the computer age, I didn’t have to fly all the way to their headquarters in Ohio for the interview. Today in 2011, this sort of thing is done right here online! Well, as you know, I do have that little ad agency – J. Walter Parsnips – and we handle mostly local accounts, generally yard sales, focusing on the medium of cardboard tacked to telephone poles. Did I tell Wendy’s this? No! 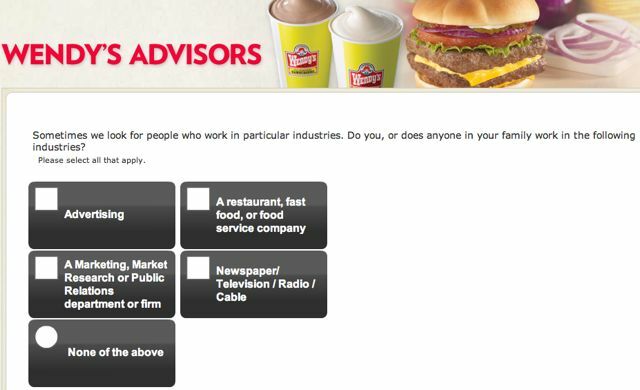 No, friends, you always check “None of the Above” or you’re going to be locked out of the rest of the survey – or in this case, that cherry job with the Wendy’s organization. Do I feel bad about not being completely honest with them? No – they lied to me first posing the question as they did. Man, they just don’t give up! Do they want my goddamn opinions or not?! Posted by Ted on August 8, 2011, 9:00 AM.